This cemetery is located just off Highway 84 in Joaquin, just across the railroad track by the Baptist Church. If you would like to submit information or pictures, please email me. Help preserve Shelby County history. In the past we have had our Cemetery home coming on the second Sunday in June but that will be changed for the 2017 and future ones to the second Saturday in June. Fellowship Hall of First Baptist Church, Joaquin. The committee will furnish the tea and ice and paper products. Custom T-shirts will be door prizes and if folks want to purchase on, they will try to accomodate orders. Be sure and check out the Museum's website for more transcriptions. Bridges Hettie 1896 1982 Spouse of John Wesley. 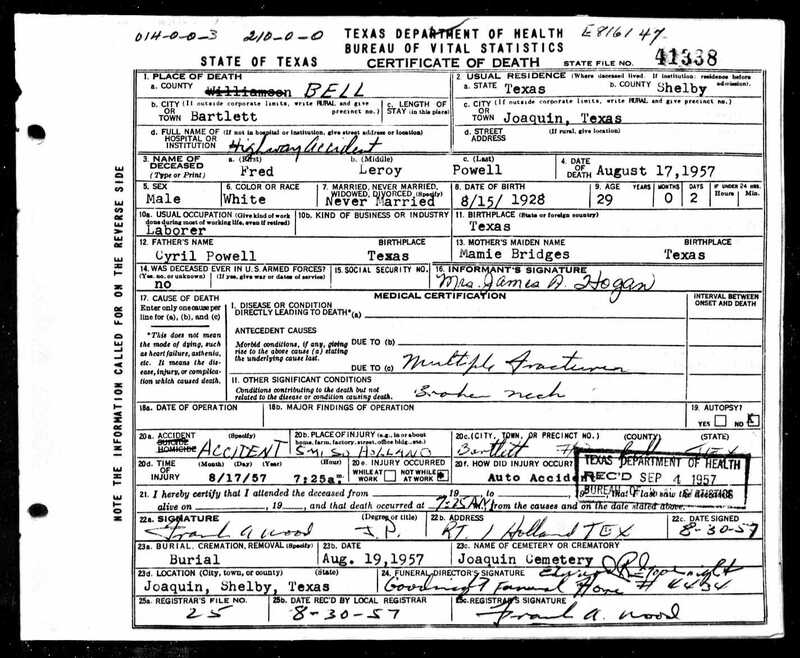 Bridges John Wesley 17-Sep-1897 Aug 1979 Son of James & Nina Bridges, spouse Hettie Durham. Powell Bobbie Swanzy 1891 1979 Wife of George M.
Powell George M Jul-1882 1951 Son of Richard & Sarah, spouse of Bobbie Swanzy. Purcer Jennie Bridges 20-Mar-1870 24-Oct-1942 Daughter of Pinkney & Susan Bridges, wife of John. Purcer John 23-Jan-1864 31-Mar-1952 Husband of Jennie Bridges.